There’s no better way to describe it than to say that this scavenger has a great vibe. Perhaps it’s because of the warm, often sultry weather…or the great restaurants…or the Civil War statuary all around. It just feels great, doing this scavenger hunt. Come check it out! Event Description: An exciting place to participate in a corporate teambuilding event, Raleigh is a modern city with a traditional feeling, serving local businesses as well as the burgeoning research triangle. Location History: Known originally as Wake Crossroads — the town began life as a rest stop for folks traveling north and south. Later, the North Carolina General Assembly bought the Crossroads from local businessman Joel Lane and laid out a planned community, modeled on Philadelphia, to serve as its permanent residence. North Carolina signed the Ordinance of Secession – joining the Civil War – from Raleigh’s State Capitol. After the war, the economy switched from cotton to tobacco, and Raleigh adapted. 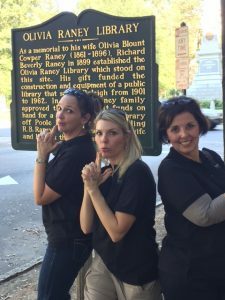 During your corporate teambuilding treasure hunt…expect to encounter statuary commemorating Confederate heroes; a 20-foot acorn; the best bbq ribs joint in the area, and many more surprises. See our other Raleigh corporate team building events.